Derrick D. Barnes is from Kansas City, MO. 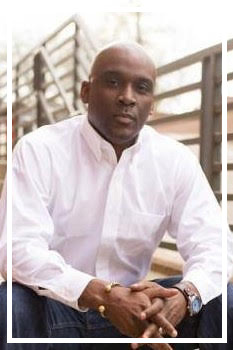 He is a graduate of Jackson State University with a BA degree in Marketing. He is the author of the critically acclaimed picture book CROWN: An Ode To The Fresh Cut (Denene Millner Books/Agate Bolden) which won a multitude of literary awards, making it one of the most decorated picture books in the history of children's literature. The awards/prizes include two 2018 EZRA JACK KEATS AWARDS (one for New Writer and an honor for the magnificent illustrations). It was also a HUGE winner at the American Library Association's Youth Media Awards, taking home FOUR Honor awards: the Coretta Scott King Author Honor, Coretta Scott King Illustrator Honor, Newberry Honor, and the Caldecott Honor. In October of 2018, CROWN also took home the lucrative and highly coveted Kirkus Prize For Young Readers.